Before becoming a successful, results-driven marketing professional at Vision Critical, Nick had a robust career as an award-winning writer for FORTUNE Magazine and a producer at CBC News. His extensive experience in print, broadcast, and online journalism has given him a solid foundation in creating compelling narratives for a wide audience which has translated beautifully to the world of content marketing. Good content is compelling content; stories that drive interest and action on the part of the reader. This is about more than just flashy dazzling click-bait headlines that get somebody to your home page. It’s about first, drawing them into your site and second, giving them a reason to stay and explore more. Journalists can bring that breadth and depth of content to your marketing team. Their experience in whittling alluring content out of the most basic of sticks can turn your marketing strategy into a true sales-driving vehicle. 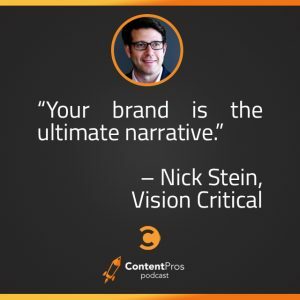 Nick knows exactly what to look for if you’re considering augmenting your marketing team by adding some journalists. His life experience both as a journalist-turned-marketer and a VP building a team makes him uniquely qualified to provide expert advice in this area. It’s hard to make big life choices as a child, and it can be even harder as an adult! Nick could never quite settle on just one thing and still hasn’t figured it out. But he likes it that way. Having a flexible attitude about what he wants to do with his life has allowed him to really roll with the punches and embrace change as it happens.